MANHATTAN, Kan. – As harvest finishes up and producers put their combines away, local coffee shop talk turns to yields and variety performance. With decision-making for the next crop underway, farmers can get an idea about which varieties to plant from word-of-mouth and the latest variety books. While variety selection can be challenging, choosing quality seed is easy. If producers want a wheat seed that meets industry standards, they should plant Certified Seed. Since 1919, producers have bought Certified Seed with confidence knowing they are receiving quality wheat in each bushel. Organizations like Kansas Crop Improvement Association (KCIA) complete an assortment of tests that must prove the wheat meets certain Certified Seed standards if producers and seed companies want to market it as such. There a few different steps KCIA must take before certifying a seed variety. Before a producer even plants a field they plan to have tested for Certified Seed labeling, they must clean all of their planting and harvesting equipment, as well as their storage facilities. Certified Seed cannot contain foreign materials, so applicants must extensively clean anything the seed may touch. Issuing authorities must also inspect the field. As harvest nears, the producer must then prep the fields for inspection by roguing noxious weeds and plants, such as other crops, that do not belong. Once the producer has prepped the field and KCIA comes for an inspection, they can start the lab work to test the seed. Although all seeds meant for sale must be tested due to labeling regulations, not all tested seed is treated equally. Certified Seed is held to higher standards during testing than regular seed testing, especially in the state of Kansas. KCIA tests nine-times the amount of seed than any other state, making sure its quality meets the acceptable industry standards. By testing 10 pound samples, they are able to detect smaller amounts of impurities, and other contaminants. 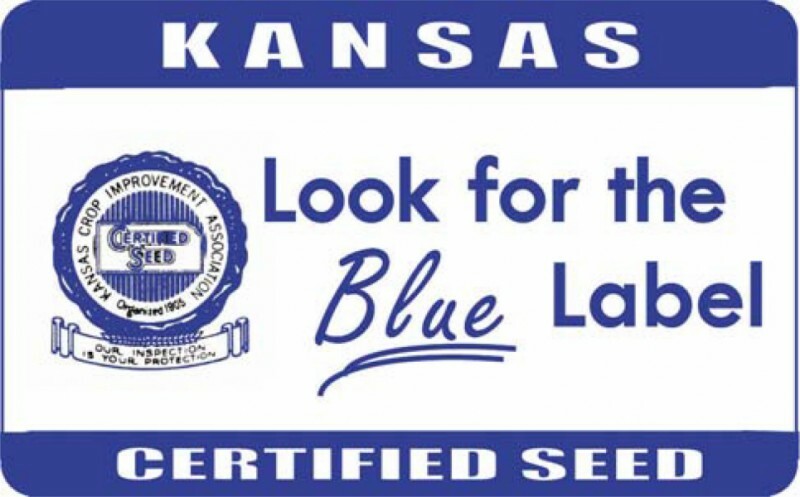 Seeing a blue Certified Seed label gives producers assurance the seed has met acceptable minimums for test weight, germination and purity, and has no noxious weed seeds. KCIA’s testing conforms to industry standards, but typically produces more accurate results. The certainty of what’s inside each bag can help when it comes time to make decisions about buying seed. Producers should check the label for specific information. Seed that’s not sold as certified has different standards to uphold. Companies may be marketing wheat seed that’s lower in quality, but there are no regulatory issues with this as long as the bags are labeled accordingly. In some cases, farmers may be planting an unknown quantity of foreign material, such as weed or other crop seeds. Seeing a Certified Seed label assures farmers of the quality of the bag’s contents, but non-certified seed doesn’t have those same guarantees. There are other ways farmers can have assurance on the quality they are receiving when buying Certified. For instance, Certified Seed labels have an expiration date. Seed that has been carried over for more than nine months must be retested to keep its Certified Seed label. Things like the name of the variety, the certification number of the seed lot, the agencies involved in the certification and the origin of the seed are various pieces of information that are included on the Certification label. It doesn’t come as a shock that conducting these tests and setting these regulations benefits farmers. Certified Seed in the wheat business has started to become the new norm, and organizations marketing Certified Seed hope the trend continues to grow as more farmers experience the peace of mind Certified Seed brings. For more information on KWA, please visit www.kswheatalliance.org.